Against the tide – Hello Korea ! Leaving my apartment today to scrounge for food, I found my door meeting resistance as I opened it. 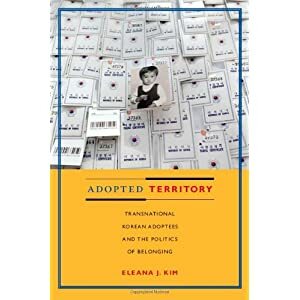 There in the hallway on the floor was a package, and inside was the new book by Eleana Kim, “Adopted Territory.” And gracing the cover is a Jeanne Modderman’s photo of the art installation, A Collection of One. It’s been out for a little while, but it’s now out in paperback and more affordable to the general public. So tonight I’m going to curl up with it and do some marathon reading (if that’s even possible since I have trouble reading these days!) of Eleana’s book as well as a 300 page research paper. We’re developing the campaign donation levels and products you can proudly display right now, so I’ll keep you up to date as they become available and tell you how you can contributions will be handled. Thanks to everyone for your kind words of support. I’ve too much on my plate to respond to everyone individually, but I do appreciate it. Less than three weeks and I’ll be back in school. Then one more year of teaching. I know my adoptee comrades are sad that I’ve decided to bail earlier, but I’m determined to make the most of my stay here in terms of work for our causes, and I’m sure that these issues will permeate all my work in the future as well. Having an end date is comforting for me. Makes being here more bearable. JJT is an amazing writer and thoughtful person. Good luck on your writing! Hopefully I’ll be able to read it some day.